So if you have read my previous post about my childhood fascination with the ruby slippers from the Wizard of Oz, then you'll understand why Sergio Rossi has made my day. 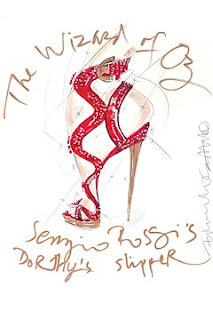 Sergio Rossi has released a sketch of his reinterpretation of the ruby slippers. Sergio Rossi along with 19 other designers are reinterpreting the slippers as part of a commemoration for the 70th anniversary of the Wizard of Oz. This commemoration will also be a showcase/auction to raise money for the Elizabeth Glaser Pediatric AIDS foundation. Buying shoes to raise money for a wonderful charity..... my kind of event!